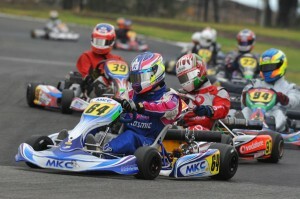 The next generation of motorsport drivers will be on show at Port Melbourne’s Todd Road circuit during the Victorian Karting Championships next weekend (March 11-13). Karting is the breeding ground for tomorrow’s top line motorsport drivers with every full-time driver in the 2011 V8 Supercar Championship starting their careers in karting. With drivers, both boys and girls, from as young as seven years of age through to those in excess of 40 years old competing at the event, the sport caters for a variety of ages. For the youngsters the sport is more about learning about car control and driving techniques than outright victory, while the more experienced drivers will be racing wheel to wheel at speeds in excess of 100 km/h chasing the victory in their respective categories. Up to 36 competitors in each category will be racing wheel to wheel in each category with the largest two being the Junior National Light and Clubman Light classes. “The championships will not only be one of the biggest karting events in Victoria this year but also Australia,” said Victorian Karting Association President David Murray. Some of the drivers expected to figure prominently in the event include multiple Australian Champion David Sera, who won a race in America last weekend, Geelong youngster Dylan Hollis, Sunbury’s Matthew Wall and Greensborough’s Lee Mitchener – who won State, National and World challenge titles last year. With more than 350 entries across 16 categories received for the event the racing will come thick and fast all throughout the weekend. Qualifying for all categories will be contested on Friday (March 11) ahead of the heat races on Saturday (March 12) and championship finals on Sunday (March 13). The Todd Road venue, located on the corner of Cook Street and Todd Road, is one of the most picturesque in the country and produces some of the most exciting racing around the 960-metre circuit.